I am a mother of two teenagers, living in the beautiful Redlands near Water, Bush and local Islands. I love to ride motorbikes, trail or road and run for fun too. Are you looking for that coffee shop? The one with amazing coffee that makes your taste buds jingle or food with a twist of yum? Harvest Coffee, Food, Wine and Banjo's Bakery Café are two of Redland's finest in my opinion. Harvest is located on High Street, Victoria Point situated beside Aldi. There is a small amount of street parking out the front but a larger car park can be found behind the shopping centre. Although the location is busy with Aldi shoppers coming and going throughout the day the food and coffee along with friendly staff will eliminate this small floor in your Harvest experience. Harvest has varied opening hours with Monday to Friday serving from 6.30am-4.30pm, kitchen closing at 2.30pm. Saturday hours are 6.30am-3pm, kitchen closing 2pm and Sunday hours slightly shorter opening at 6.30am-12pm with kitchen closing at 11.30am. 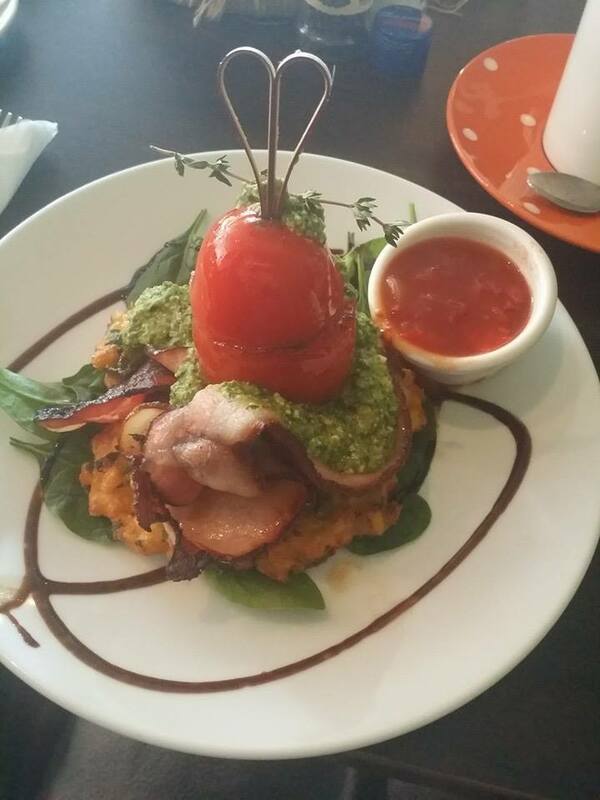 As you enter Harvest you will understand why it has won Best Café Redland City in 2014. The shop has a spacious feel with modern style bench seating along with your regular tables and chairs inside or out. It is a busy coffee shop and the staff work like a well oiled machine taking your orders and delivering mouth watering food and beverages, all with a smile on their faces. Harvest has an all day menu with a large selection of well portioned foods but, the best menu of all is the Sunday Breakfast and Brunch, with lighter delicious foods such as yoghurts, porridge, pancakes or as quoted by Carolyn Hunt, 'Corn fritters Pesto Stack with the Redlands Famous Relish', to the larger meals, fit for a cyclist who has just pedalled over 100k to meet his mates for a full strength, smooth after taste, strong flat white and a king sized bacon and egg roll. The coffees like the meals come in several sizes ranging from your usual take away small, medium or large to dine in king sized coffees. Harvest use Merlo coffee which depending on your strength can not only give you a good bite of coffee but leaves a smooth after taste in your mouth. When ordering your coffees, staff are understanding to each individuals wants, asking whether you would like hot, warm and understand even the most confusing request for half strength, skinny latte, warm, which also came out leaving that beautiful, smooth coffee taste in your mouth. Harvest doesn't just stop at coffee and great breakfasts they also stock smoothies, bottled drinks, iced drinks and have a selection of pastry goodies on display. Banjo's Bakery Café which opens 7 days from 6am-6pm, is located on Middle Street, Cleveland, shop 24, just up the street from The Reject Shop. Hidden away between busy shops and people walking the sidewalks, is this beautiful bakery, coffee shop wonder. There is front street parking but you can also enter Banjo's from the back of the shop after parking in the Woolworths car park. Banjo's is known for donating to support local Junior sports teams and help with charity fundraising too. The hustle and bustle of people walking by outside this shop gives it no justice. As you enter the Bakery, you are not only taken aback by the beautiful presentation and warm feeling of a family bakery, but the aroma of fresh baked bread and pastries is all so alluring. The presentation of this shop is mouth watering with so many foods on display to buy. From breads, rolls, muffins, cakes, tarts and slices to pies, sausage rolls and pasties including vegetarian. There is such a large selection for all the family to eat. The staff young or old are kind and gentle with a friendly smile, only too willing to help you choose your delicious treat or daily bread. Whether you are looking for a Sunday brunch sitting in the quaint little shop or wanting a take away coffee and feed, Banjo's bakery offers both. The coffees are served in your regular three sizes with two marshmallows added to hot chocolates, if you please. The coffees have a perfectly smooth, gentle coffee taste but I wouldn't recommend asking for half strength if you like a good strong coffee. Each coffee comes with little, scrumptious complimentary biscuits. With your coffee ordered there is only one decision left. Which delicious treat am I going to choose. If you are a vegetarian Jo Jo Burton recommends the Cauliflower Cheese Pasty. As she quoted 'A refreshing, vegetarian alternative which isn't just spinach and cheese'. Our choice for a Sunday treat was the Raspberry Custard Tart and Blueberry muffin. The blueberry muffin was a wholesome choice but as you bite into the tart the bitter sweetness has your taste buds dancing around your mouth. Every bite is like a little piece of heaven. We can not wait to go back and try more of this selection including blueberry custard tarts. If you are looking for a cool refreshing drink to have with your pastry, Banjo's has other fruit drinks and soft drinks on offer. So whether you are looking for the coffee shop with awesomely hearty breakfast meals or the coffee shop with a nice savoury or sweet treat, these two coffee shops offer the whole package. Well made and smooth tasting coffees, pleasant eating areas and beautiful, tasting foods. Next time your are in Victoria Point or Cleveland make sure you drop in and tempt your taste buds with a twist of yum.